Thankfully Mrs Thatcher's funeral service passed off peacefully. One of the hymns chosen for the service was John Bunyan's "Who would true valour see'. Its' a hymn that most people of my generation being brought up in Bedford, would have been familiar with. 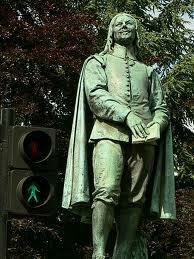 After all, Bunyan was the 'tinker of Bedford', and is perhaps Bedford's most famous son. It appears that the hymn was only introduced into English hymnals in 1906 and Dr Percy Dearmer who edited the book, was not keen on Bunyan's rather dramatic words. Hence his alteration. So why stick with hobgoblins and foul fiends? Well Bunyan's masterpiece, The Pilgrims Progress, gave a vivid account of the Christian life. This life was marked by frequent challenges and obstacles, and in the person of Valiant-for-Truth, the pilgrim continued on right to the end. The book is a helpful corrective to any modern day account of the Christian life suggesting constant success and convenience. Yep. as Bunyan rightly points out there are plenty of experiences to daunt the spirit. But some of the Christian's obstacles are more imagined than real-hence the hobgoblin.